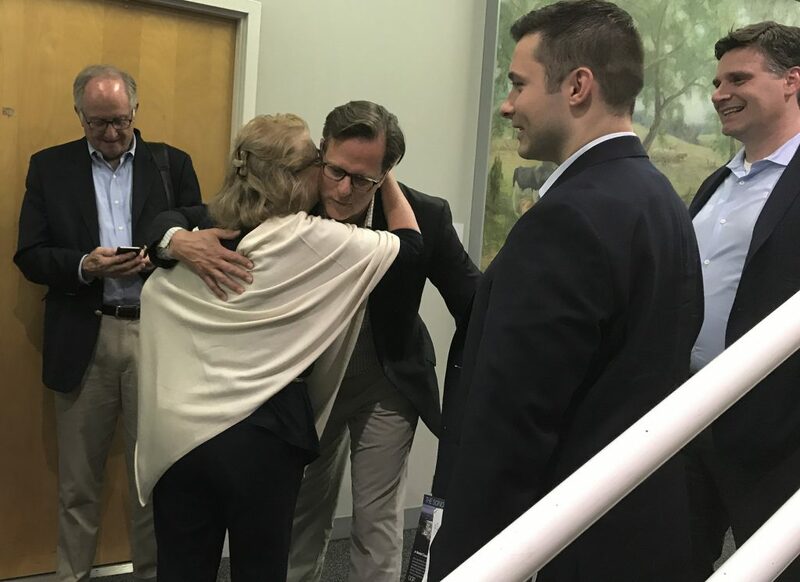 Wini Mola hugs GGP Vice President Doug Adams on Thursday, after the Norwalk Zoning Commission approved GGP’s request for modifications to The SoNo Collection. NORWALK, Conn. — It’s full steam ahead for The SoNo Collection. The Norwalk Zoning Commission on Thursday unanimously approved GGP’s requested modifications for its mall, the removal of the hotel and some parking spaces, without resistence or even any discussion. Only three members of the public spoke at the brief public hearing, their comments largely in favor of the mall. That’s the last hurdle for GGP, in terms of city approvals. “Now we just have to get it built,” GGP Associate Developer Rob Jakubik said after the vote, to other GGP members and a jubilant citizen. Construction has already begun, with work on the foundation progressing at the West Avenue lot just south of Interstate 95, on either side of North Water Street. Language changes that drew controversy at the Common Council level did not even draw questions from the Commission. Changing the definition of retail removes ambiguities that could give later generations difficulty years from now, Attorney William Hennessey said. Retail is “a narrow term in the world and it’s also not a defined term in the regulations,” he said. “We thought it would be good to just point out a couple of uses that could find their way into the mall over time, certainly nothing now, but would not necessarily be considered retail to the staff, because those are definitions that pertain to those uses,” Hennessey said. GGP Senior Designer Paul Madden said 148 parking spaces are being eliminated, all in more remote areas of the mall. “My client is very excited and very anxious to continue the pace of construction so this facility can open in October of 2019, just a little over two years from now,” Hennessey said. Expressing “wholehearted support” was Wini Mola, a realtor who has spoken at previous public hearings. Sallie Marsico resumed her objections to the LED billboard planned to face I-95, urging the Commission to take the opportunity to reverse the approval it granted the signs last fall. But, “It is wonderful that an outstanding developer is about to build an outstanding mall with outstanding design features and outstanding department stores on this outstanding parcel of land. There is absolutely no doubt in my mind that The SoNo Collection will be a success and grow in that success over time,” she said. Hennessy’s reply was that the signs were approved in a separate application. He produced a letter from Michael McGuire to further illustrate why GGP felt it necessary to remove the hotel component from its mall. Again, there were no questions from the Commission, and the public hearing was closed. GGP has agreed to pay Norwalk $3.5 million in lieu of building the hotel. Attorney Eric Bernheim, special counsel to the city, told the Common Council last month that there’s an appeal period on GGP’s approvals, meaning that the money would be available at earliest the middle of July. Is there any information on the appeal process mentioned in this article? GGP Senior Designer Paul Madden said 148 parking spaces are being eliminated, all in more remote areas of the mall.Could Norwalk of used those parking spots for something else? absolutely not. The transit agency said Wednesday that fliers had been placed on GoTriangle riders’ cars saying they would be towed if parked at the mall outside the hours of six a.m. to six p.m. Monday through Friday. In a 2008 agreement between the city and the mall, Southpoint agreed to set aside 147 of its parking spots for people to park their cars and board GoTriangle buses. The mall had offered to accommodate park-and-ride vehicles when it asked the city to rezone the property in 1999. Our city shows once again low hanging fruit still exists . Still no reason to think Norwalk has not made the best deal for its taxpayers. Anyone from GGP suggest who the partner will be for the mall yet? Im sorry that was 1800 new jobs in Ct in one building ,imagine what that would of done for Norwalk.Giving people jobs so they could go to a GGP mall. No questions from the Commission – really? None? Amazing. Good for GGP, I suppose – they out maneuvered City Hall. At long last! Very exciting for Norwalk. Can’t wait to shop there! Now if we could get B&N interested….. The Sono Collection Mall brought to you by the Norwalk Zoning Commission. Ushering the city into the 1980’s. Looking forward to dining in the food court. I can’t wait for the food court, I love Panda Express. Did anyone else see that in the next 5 years around 20-25% of all malls will be closing? Has anyone checked the credit ratings of the proposed retailers?, they may not be around when the time comes to move in. I, too, like to ice skate uphill. Norwalk should have put something here that is innovative and really sets a precedence for a new future. I really hope it works out for us in Norwalk. I think the Hotel would have been a great addition but I guess now if or when the mall fails they can knock it down and make a hotel. Looks like another mall staple is going bye-bye.